Art4Space also has a studio in South-West Wales. 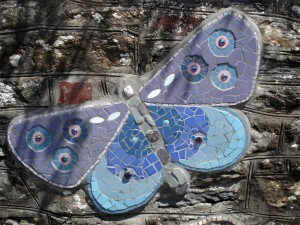 We work in several mediums including mosaic and cob. Our workshops transform dull playground walls into vibrant interactive murals and use natural, local materials to create beautiful cob ovens and earth artworks. We facilitate awareness, participation and ownership in our environment in a positive and uplifting way. Our aim is to promote investment, pride and creative expression in an exciting, fun and shared learning environment. Art4Space respects cultural diversity and works in a socially inclusive and sustainable way. Angela Rekers talking about My Garden Grows Mosaic at Ffairfach School. Meinir Morgan, Headteacher of FFairfach School talking about My Garden Grows Mosaic.